18-06-2016 : 105 out of 164 successful candidates in TNPSC Group 1 Mains are from Manithaneyam IAS Academy - Dinathanthi News. 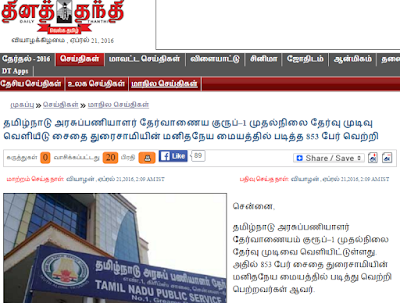 TNPSC recently published the result of TNPSC Group 1 Mains Examination 2015. There are 79 total vacancies which includes 3 Deputy Collectors and 33 DSPs etc. 21-04-2016 : 853 out of 4033 candidates passed in the Group 1 Preliminary Exam 2015 is from Manithaneyam IAS Academy - Dinathanthi News. The coaching centre is going to conduct free coaching for TNPSC Group 1 Mains Coaching . The candidates are asked to come in person with Copy of Group 1 Hall Ticket, Passport Size Photo. Study Materials and classes are completely free for the candidates. Accomodation facilities will also be arranged according to preference. Manithaneyam IAS Academy has announced free coaching for TNPSC Group 1 Mains Exam 2016. You can apply for the free coaching online from the following official website of Mainthaneyam Academy. Mr.Sam Rajeswaran from Manithaneyam has informed that the free coaching classes and Model Tests will be conducted for all registered TNPSC Aspirants.